The speed limit drops from 65 to 25 mph at the town limit of Bridgeport, California. But you wouldn't want to be driving fast, anyway. A one-street town with a population of 575, Bridgeport marks the northern end of the Sierra Nevada's steep eastern escarpment, where skiers are drawn to 14,000-foot summits that precipitously drop 8,000 vertical feet to vast plains. For skiers driving south from Reno or Tahoe on spring backcountry missions, Bridgeport is their first stop. 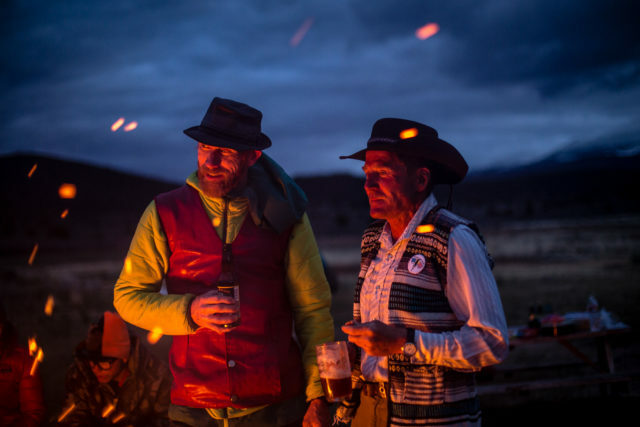 "A campfire, a bottle of wine, and a guitar, and you can climb something up to 8,000 vertical feet and ski it and spend the night in the hot spring," says Glen Poulsen, 57, a Tahoe-based skier who has been skiing lines in the High Sierra since well before he got his driver's license. In 1998, he and four buddies bought 475 acres just outside of Bridgeport, home to hot springs, sagebrush, wildlife, and stunning views. Poulsen (whose father co-founded Squaw Valley in 1948) and his friends donated 75 acres to the Eastern Sierra Land Trust, and set up camp to launch ski tours into the surrounding backcountry. Every spring since the early '80s, Poulsen tones the vert down to host a group of friends in Bridgeport. The tradition started as a birthday party with 15 or so people. Thirty years later, the weekend has morphed into an annual gathering with as many as 100 skiers ranging in age from 6 to 76. It's called the Chuteout. 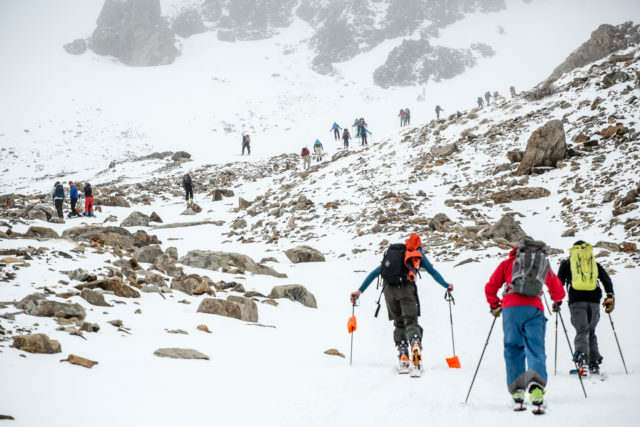 The group skis a route off Dunderberg Peak that's visible from town: a 4,500-foot ski descent in two couloirs separated by a traverse across a long plateau. The last pitch is a 3,000-foot shot that cuts a bullet-straight line down the mountain. Afterward, the bonfire back at camp gets hot. I drove 425 miles from Southern California to join the festivities. But first, I had another Bridgeport classic in mind: 12,280-foot Matterhorn Peak. Made famous by Jack Kerouac in The Dharma Bums, it is the apex of the Sawtooths, an aptly named subrange that towers over Bridgeport and, on the other side of the crest, marks the northeastern boundary of Yosemite. Punctuated by toothy arêtes and spires, the Matterhorn—a massive dihedral of granite that sits centerfield in a cirque of monoliths—would be my warm-up. Shortly after 8 a.m. on a glorious Friday morning in April, I arrived at the trailhead, a few miles from Bridgeport at the end of a country road. Not one cloud was in the sky. My ski partners, Tahoe locals Ryan McAuliffe and Ali Noble, were waiting for me, sitting in camp chairs and soaking in sunlight. I made a turkey sandwich and shouldered my pack, skis, and boots. In classic Sierra style, the three of us set off in tennis shoes, hiking for the next 1,000 vertical feet over three miles of dirt before we could transition to skins and skis. From there, it was another 4,000 vert or so on snow. From the moment we clicked into our skis, McAuliffe's eyes were focused on his surroundings, and he made verbal notes of details like point releases, roller balls, the angles of the sun, the wind, and the dark clouds starting to brew in the south. Coming from sea level, I fell behind. We climbed an open bowl, then wrapped around to the back of a ridge, skinned through sparse, twisted high-elevation pines—lodgepole, whitebark, limber, foxtail—and crested a shoulder that revealed a half circle of granite arêtes—and the Matterhorn's summit. The dark clouds caught us, the day's bright light turned flat, and flurries started to accumulate. Noble and I chose to skin to the east shoulder of the basin while McAuliffe booted up a steep couloir called Ski Dreams. By the time Noble and I ate an apple and a handful of gummy bears, McAuliffe swooped past us making a series of clean, arcing turns. The conditions took me back to midwinter. I expected springtime corn, but here we were on April 29 making powder eights in boot-top pow for thousands of feet back down to the valley floor. There were no tracks, no other voices, just the wind and, to the west, toward the crest of the range, mountains as far as I could see. That evening, we drove across town to Poulsen's property. A teepee stood in a clearing at the end of a muddy, rutted-out road. "The thing that is refreshing about Bridgeport versus any other backcountry ski town—nothing has changed since 1955," says Poulsen. "In fact, it's slower now than it was then; it's like going back in time. People think California is crazy, but relative to other ski communities, it's pretty quiet." Town was quiet, sure. But later that night, around a bonfire that raged in front of Poulsen's teepee, the volume cranked with guitars and wine. The black clouds enveloped our fire ring and fat flakes drifted into the flames. 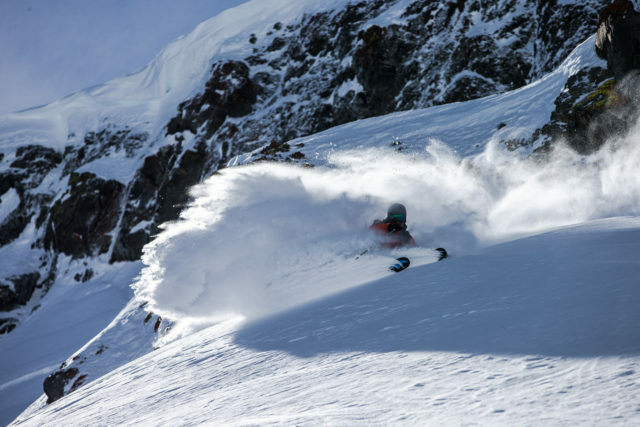 In many ways, the backcountry ski scene has flourished under Poulsen and the friends he brought down from his hometown in Tahoe, including Jim and John Morrison, who went on to become two of the most prolific ski mountaineers in the range. 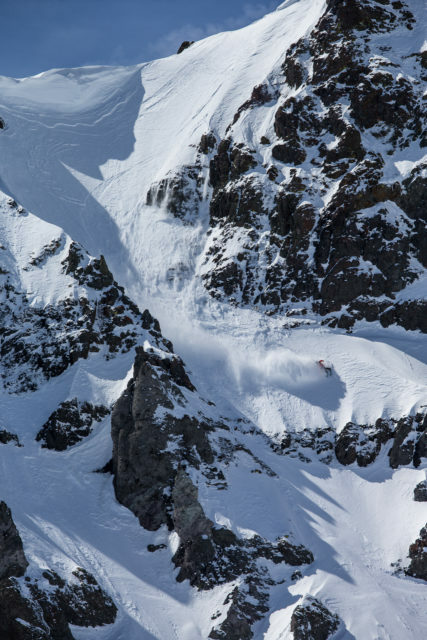 Poulsen started on the classic lines, like Bloody Couloir, near Mammoth, and Tioga Pass. In Bridgeport, he's skied the Matterhorn many times, and beyond—the Incredible Hulk, Twin Peaks, Mount Walt. When it's deep, or after the road opens in the spring, he heads north to Sonora Pass, which gets the most snow in the region. "The thing that is refreshing about Bridgeport versus any other backcountry ski town—nothing has changed since 1955," says Poulsen. "In fact, it's slower now than it was then; it's like going back in time. People think California is crazy, but relative to other ski communities, it's pretty quiet." At midnight, I left the heat of the fire and crawled into my 15-degree sleeping bag. I fell asleep with a Nalgene bottle of hot water keeping me warm. When I unzipped the tent's fly the next morning, I stepped into a white world. A fresh layer of snow covered the bushes, trees, tents, and cars. The mountains were hidden from view by clouds, and skiing became a question mark until Poulsen walked up to the coffee circle and announced the 20-minute countdown to departure. Another 5,000-foot day was imminent. Yesterday's storm clouds made today's visibility milk white. The tour started by climbing an elevator shaft up the backside of Dunderberg Peak. The clouds made it hard to tell how high or far I had left to go, but after a few hours of hiking, I knew I was close when I could hear the summit party. Those first to arrive waited for everyone else at the top. There were probably 75 people in all. A box of red wine was passed around, as were a couple smokes and some trail mix. After a half hour, the group pushed to the ridge and dove in. The snow was blower—deep and fresh. The only tracks were those at the front of the group. The rest of us, though, enjoyed the company: old dudes, newbies, splitboarders, skiers, dogs galloping through the snow. McAuliffe, Noble, and I teamed up and skied the first pitch in a complete whiteout. Had there not been rock walls, I would have lost myself to vertigo, but the storm kept the snow cold. Ten minutes of hot sunlight and everything would have been rolling downhill. When I reached the apron, skiing turned into a Zen-like practice. I remembered Kerouac and his sage advice: "You can't fall off a mountain." I trusted my intuition and turned in the direction of gravity. On a moonscape plateau, we slapped our skins back on and traversed a wind-scoured surface where the terrain rolled up and down across numerous false summits. I lost my sense of time and focused on the skin track until we finally made it to the mouth of the Green Creek Couloir, a 3,000-foot gash in the mountain that dives straight into the drainage below. We all swished turns to the bottom, and true to Sierra Nevada form, the snow became heavier the farther we descended. The grand finale was an epic bushwhack to a log crossing over Green Creek, followed by a short walk through a campground to the parking lot, where a welcome committee hung around drinking beers. The last skier to arrive got the loudest cheer. That night, back at the campfire, the clouds finally lifted and the sun split the horizon above Bridgeport with streaks of neon pink. Sausage, elk, boar, and tri-tip sizzled. The guitars came out again. A chorus of conversation rose with the heat from the fire. The city sprawl of California on the other side of the range felt far, far away. That night, I slept the kind of sleep that replenishes. In the morning, I could hardly move. My nose and lips were chapped, sunburned, and wind-burned. My hair was a sweaty, matted mess, but my spirit had never felt better. By the time I stepped outside to make coffee, Poulsen and his gang of skiers had already left camp to bag another 5,000-foot descent. Bridgeport, after all, is the tip of a vast amount of skiing. They were just getting started. Gas and food are the only expenses on a camping trip to ski the Eastern Sierra. For two days and three nights, the author spent $66 on gas and $75 on food. Soothe the aches of a huge day of skiing with a mineral soak, courtesy of Bridgeport's many natural hot springs. Travertine, just south of town, has a handful of mini pools of varying temperatures. Buckeye, north of town and located next to a freshwater river, offer a hot-cold mix. BYOB. Highway 395 is the route. Stop in Lone Pine, home to the highest point in the contiguous U.S.—Mount Whitney—and get a dose of old Hollywood. John Wayne stayed in the historic Dow Hotel while filming Westerns. Order the double bacon burger with cheese and jalapeños at The Burger Barn in downtown Bridgeport. Purple wig, zero-degree sleeping bag (or a Nalgene for hot water), flip flops, headlamp, bathing suit, flask. Haribo gummy bears, chocolate, peanuts, banana chips. 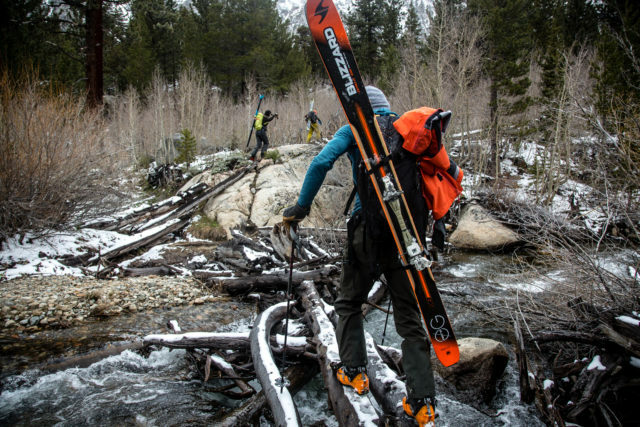 The guidebook, “Backcountry Skiing California's Eastern Sierra, 2nd Edition,” by Dan Mingori and Nate Greenberg, is a good place to start.